A client recently sent me this question about Facebook reviews. If you search for me in the Facebook search box, it brings up our studio with places being at top. If you click “see all” you see a negative review by an irate customer that happened a while back. Is there a way to push that review down because we have had so many 5-star reviews since then? I do not want that one bad review to be the first one everyone sees. I appreciate your frustration. With so many positive reviews to choose from, it has to be annoying when Facebook highlights your single 1-star review first. It appears from comments from other Facebook users that highlighting the lowest rated review on a business page is a common complaint. So the simple answer from Facebook is no, you cannot manually move, delete or change it. The order of Facebook reviews is decided by a computer, not a person. However, after a little research, the common denominator seems to be that Facebook does this to businesses who has too many positive reviews. Sounds crazy, right? Who can be too good? Since you have all 5-star reviews and a single 1-star review, FB is actually trying to help your business by showing you’re not perfect. No business has 100% happy customers. In fact, potential customers who see too many positive reviews will think your business is cheating. The next time you’re searching for a product on Amazon, notice that on the product page they show the highest rated positive review and negative review side-by-side (on a desktop monitor). Facebook is trying to do the same thing. 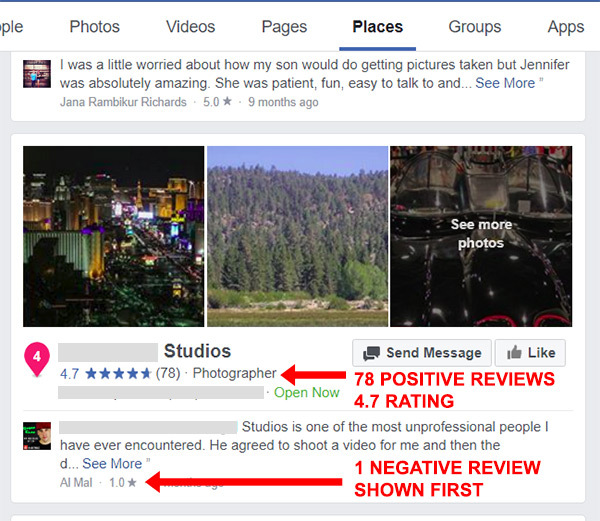 They put your big 4.7 blue star rating on the left next to your studio’s business page, then show the first negative review beneath it. Ironically, you may be able to “hide” the 1-star review by getting a more recent 2, 3 or 4-star review. For example, if you had ten 5-star reviews and a 1-star review your average would be 4.6. If you added a 3-star review. Although your average would drop to 4.5, as long as your average is between 4.5 and 4.8 you’re fine, and it will look more natural to Facebook that you have mixed reviews. Another thing to try is when you get 2, 3 or 4-star reviews to post more lengthy replies to the customer’s review. Facebook promotes reviews that have lots of posts and likes. If your 1-star review is the one you posted the longest reply to or it received the most likes, you’ll need to do even more for a different review you’d want to show up on top. I’m not saying to ask customers to give you lower reviews, I’m only saying that over time, as you get more reviews, you should get more 2, 3 and 4 star reviews. These should eventually push the older, 1-star review off the top of the Facebook search page. Answer immediately. About 1/3 of clients will change their review if they like your response and solution to their problem. Apologize and take responsibility. It’s your business, it’s your responsibility. Don’t blame the customer, the weather or your staff. Explain what went wrong and how you plan to fix it. Most negative reviews reveal larger business problems you may not even realize you had. Thank the customer for bringing it to your attention. This makes them think you’ve listened to them. Even if it is on top of the search page, if you’ve taken time to answer the complaint properly, other potential customers will read this and will appreciate your superior customer service.